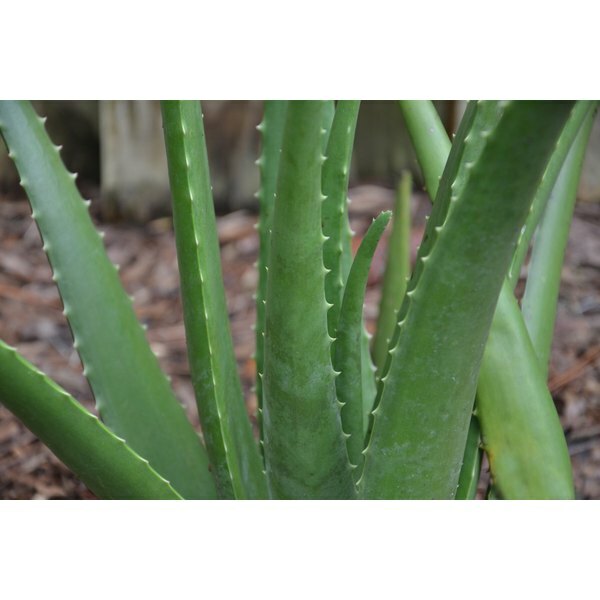 Aloe vera, also known as medicinal aloe, looks like a desert cactus with tapered, pointed leaves. These thick, spiny leaves contain a thick sap that helps heal many skin irritations. Many mothers keep it on hand to soothe sunburns, blisters and other skin conditions. The sap soaks into the skin and keeps away infection while soothing pain and making the skin supple again. These characteristics also make aloe vera a popular treatment for acne. Though not all acne responds to aloe vera treatment, the sap is said to help clear the skin and rid it of scarring. Cleanse your face with a mild exfoliant. Gently rub the particles over your skin and rinse them away with cool water, patting your face dry with a towel. This removes dead cells, unclogs pores and cleans the face. Pinch a leaf from an aloe vera plant; you need no more than an inch of plant for each application. Slice it open along one side with a very sharp knife. Spread the leaf open, sap side up. Scoop some clear sap from the leaf with your fingers. Spread it over your face in a thin layer, rubbing it in until you can’t see it anymore. Let it soak in overnight and rinse it away the next morning with cool water. Apply aloe vera this way each night before bed. Exfoliate only every three days; the rest of the time use a mild facial soap or skin cleanser before application.